Great makeup starts with a great base and I know you want to be looking flawless on your big day. If you're not wanting to invest loads of money and time into spending hours at skin specialists getting fancy treatments, these easy tips will help you get the best makeup results for your Queenstown wedding (especially if you're travelling in for your special day). Be prepared for your skin to get dry when you arrive in Queenstown (especially in the winter time) because Queenstown sits at a higher altitude the air is dryer, which in turn affects your skin if you're from a different climate. Also if you are travelling from abroad, extended hours in a plane will dehydrate your skin too. I recommend the Kiri NZ Manuka Honey Moisturiser as a great day time moisturiser. Exfoliated skin is a makeup artists best friend! Removing dry, dead skin to leave a fresh face, creates the perfect base to work with. I would recommend you exfoliate 2 to 3 times a week leading up to your wedding and then lightly the night before the big day. If you don't already have an exfoliator you love and trust, test one on a small patch of skin to ensure you don't have any reactions to the product. Keep a high quality lip balm on hand at all times leading up to your wedding. It's so important to have well hydrated lips, especially if you are wanting a bold colour or matte lipstick look for your wedding day - these types of lipsticks often don't work well with cracked or peeling lips. I would recommend the Nellie Tier Lip Balm. A dedicated lip scrub is a product I've recently discovered and I love it! It's a total saving grace if you have a little bit of dead skin on your lips you want to safely remove. Remember don't try and peel dead skin off as you might make it bleed or damage the skin. 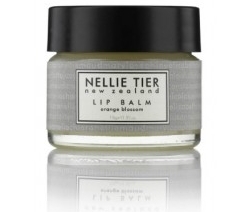 I would recommend the Nellie Tier Lip Scrub. Keep that face clean! We are all guilty of occasionally forgetting to take off our makeup, but in the weeks leading up to your wedding try as hard as you can to be super strict on this as it will help to prevent breakouts. Also if you are on a long haul flight to Queenstown for your wedding try travelling with a makeup free face, this will also help to prevent breakouts. I would recommend the Murad Refreshing Cleaner. I recommend the Origins Anti-Ageing Eye Treatment. Yes sunblock :) and not just for your face but if you are going to be outside having your wedding photos in the middle of the day and you have exposed shoulders , they will get burnt. The sun in New Zealand is extremely unforgiving, especially in the peak of summer and no doubt you don't want summer burn ruining your evening. Remember to very careful when applying to ensure you don't get any on your dress!! Keeping your body well hydrated is key, especially if you're travelling from abroad. Getting dehydrated can often affect your skin and can cause you to break out and that's the last thing you want just before your wedding day. There is something extremely satisfying about having freshly groomed brows and this can make a real difference to your overall makeup look on your wedding day. If you have a trusty regular beauty therapist you see, make sure you book an appointment a few days before you start making your way to Queenstown. If you are getting waxing or threading done or know you are prone to redness from these treatments make sure you allow time for this to heal. If getting your eyebrows professional groomed isn't something you do regularly make sure you get some recommendations before booking and consider having a trial a few months or more before the wedding to ensure you are happy with them. It's important to keep in mind that your makeup artist won't be comfortable to re-shape or pluck your eyebrows on your wedding day as it may cause redness and not all artists are trained to do this. Tinting gets every last hair right down to the roots making your eyes look amazing. If this is a procedure you've never had done before, book in a trial well in advance before your wedding day to ensure you don't have any reactions to the products used. Along with making sure you book with a qualified, experienced and highly recommended beauty therapist. If you have any questions about these tips or would like more recommendations please get in touch with me. For more info about my Queenstown wedding makeup service click the button below. EVE Beauty is located in Frankton at The Landing - 5 Hawthorne Dr and we offer a range of beauty treatments, including nails, acrylic extensions, waxing, tinting, spray tanning, lash extensions, makeup lessons and more. You are able to view our full services list & pricing HERE. I'm so excited to introduce to you the newest addition to EVE Makeup Artistry. The extremely talented, Philippa Walker! As soon as I met Danielle & Renae, I knew there was something special about these two. They were both so welcoming, relaxed and open to chat to me about their journey. Even before I was a full time makeup artist, the M.A.C Cosmetics Mineralize Skinfinish highlighter in the shade "Soft & Gentle" was always my holy grail highlighter. It's always been the one product that when I pull it out of my kit, so many clients say "I have that one too". With out a doubt it's such a beautiful product and extremely easy to work with. There is no question that Queenstown is easily one of the most beautiful place is New Zealand, maybe even in the World to get married. The great thing about this amazing part of our country is no matter what style of theme you want for your wedding you'll be able to find the perfect wedding vendors to suit you. When it comes to deciding on what you'd like your makeup to look like for your wedding day it can often feel a little overwhelming, especially when you have so many other things to think about and plan. Weddings can make for a very long day when you're the bride and one question I get asked the most is "will my makeup last all day". With the correct products and the right application the answer is YES absolutely, but there are a few things you can do that will help to make a massive difference. Spring is an absolutely stunning time of year to get married in Queenstown, especially if you want to take advantage of the beautiful views and take a helicopter trip to get some amazing photos!